Sennheiser’s Wireless System Manager software allows you to control, monitor and setup large systems across mics and IEMs with ease and it works on EW300 series on up the line to Digital 9000 series. 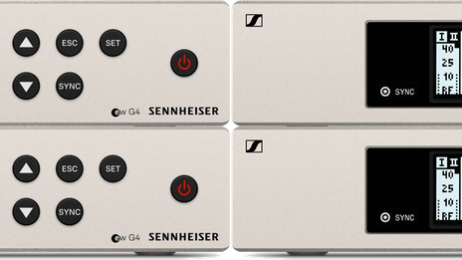 BUT… what if you have a few channels of 100 series G4 systems? Are you being punished for buying the less expensive system by having to do 4 times the work? Of course you’re not! The evolution 100 G4 series allows you to coordinate up to 12 channels by networking the systems together using the RJ10 port on the back of the receiver and the corresponding cable that is included in the box. It’s really simple. You just create a small network by connecting each receiver together in a daisy chain configuration. Run a scan on the first receiver in the chain and set the frequency. The other devices in the chain will then prompt you to assign their frequency as well. You confirm the change on each receiver and BAM!!! You have a frequency coordinated multi channel setup that will be free of intermodulation problems. For detailed directions on how to run the scan and setup your systems, follow THIS LINK to the proper section of the online manual.